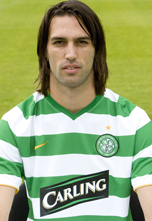 • Georgios scored on his Hoops debut, coming on as a substitute in the Scottish Cup victory over Kilmarnock at Rugby Park and netting one of Celtic’s five goals. • He also scored in the 2-1 league victory over Inverness Caley Thistle, which was his first goal at Celtic Park. • And he came off the bench against Hibernian at Easter Road on March 1 to head home Celtic's second goal in the 2-0 victory. • He joined Manchester City from Dutch side Heerenveen, having scored 29 goals in 88 league games for the club. • He netted 12 goals in 65 appearances for Manchester City. • Georgios has also scored three goals for Greece in 12 international games and is hoping to make it into Greece’s Euro 2008 squad. • His most recent goal for Celtic came in the 1-0 victory over Aberdeen on April 19. • His most recent goal for Celtic came in the 1-0 victory over Aberdeen on April 19 .